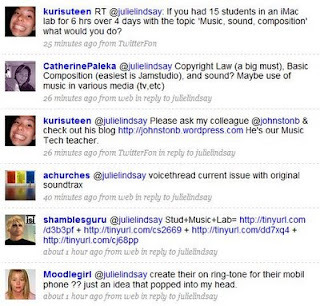 The Global Educator: Music, Sound Composition: My PLN does it again! I am challenged by our Week Without Walls here at Qatar Academy. Next week ALL Grade 6-10 students are off regular timetable and doing alternative things. Most are going on international trips but a large percentage are staying in Doha. So as a faculty we have been putting together a program that is engaging and meets the needs of the MYP philosophy. As part of the Grade 9 team, who have an away trip to London to soak up the arts and culture (theatre, theatre, shopping, theatre), I am back here on campus helping run the "Doha Arts Experience". The Ning is new, but our schedule for the week is linked. My part in this is meeting with the rotating groups of students, 3 times a day for 4 days in a row thr iMac Lab with a focus on "music, sound and composition". Typical (well not really, but life does seem to get busier these days), but I have left it until now (Thursday) to start planning and prepping for our first day without wall on Sunday. So what to do?? What would my PLN do?? Earlier this morning, a quick email to colleagues in Europe, Chris Chater (music teacher and web master at International School Paris) and Nancy von Wahlde (tech facilitator at American School Madrid) had responses of a sharing good practice blog post with music-based resources and ideas, links to Chris's Opus 8 Ning showing Grade 5s sharing musical creation, and a reminder of another Ning where a global music collaboration is taking place between India and USA, Go Make Music. OK, I thought, ideas of collaboration and using instruments....hmmm...not sure, I wonder what my Twitter PLN will come with? So about 1 hour ago I tweeteed this: "If you had 15 students in an iMac lab for 6 hours over 4 days with the topic 'Music, sound, composition' what would you do?" 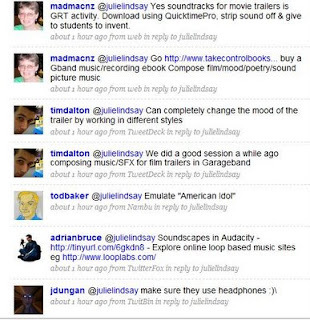 Here are the amazing responses ....and I am forever in awae of the immediacy and intimacy of this communication tool. Thank you tweets! From Jeff Dungan in Shanghai - be sure to wear headphones....thanks for the reminder Jeff! From Tim Dalton in Hampshire, UK - "We did a good session a while ago composing music/SFX for film trailers in Garageband"
From madmacnz Christchurch, New Zealand- Take control books...these look great! I am buying Take Control of Making Music for Garage Band 08 to start with, as an eBook! Madmacnz also recommends "Build up to doing trailers on last day - have some only 30 secs, others longer. Use http://www.findsounds.com/" with a further tweet warning, "...but beware will need to convert some sounds in iTunes 1st so Garageband can import them eg wavs (Advanced, convert to mp3)"
Then there is wonderful set of resources provided by Chris Smith at Shambles: Music and ICT; Music online Web 2.0; Music notation; Music resources provided by Shambles...thanks Chris! From Christine at the Yokohamo International School, "Please ask my colleague @johnstonb & check out his blog http://johnstonb.wordpress.com He's our Music Tech teacher. From Catherine in Hawaii, JamStudio online music factory...looks good! More from my frind Chris Chater in France, "Radio show with script, voices & background from loops - record in Garageband and publish to iTunes as a podcast with picture"
OK, a little tongue in cheek from Nick in the USA (I think), "write a performance time and the words "smoke on the water" on the board." ??? A current student, Abdullah, who I featured in a blog post recently "Ask Abdullah", writes "How old? 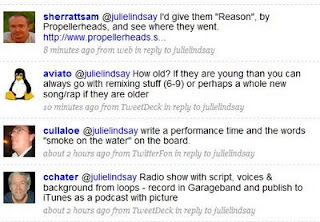 If they are young than you can always go with remixing stuff (6-9) or perhaps a whole new song/rap if they are older"
Then from Tianjin again, Sam Sherratt, "I'd give them "Reason", by Propellerheads, and see where they went"...hmmm, another one to really explore. So, once I have sifted through these ideas and tried out some resources I will let you know at the end of next week what I ended up doing....and how it worked!